Wednesday, November 19, 2014, was Natonal Zinfandel Day. On that day, I did enjoy a glass of Zinfandel from the Renwood Winery from Amador County in California, and was making notes so that I could let you know about this wine, and another Zinfandel wine that they produce. Zinfandel in California is characteristically a big red wine, with lots of jammy berry fruit flavours, and soft tannins. A wine that is easy to sip, and to enjoy with full flavoured foods, such as bbq or roasted meats. The two bottles of Renwood wines I tasted were provided to me by their local agent. 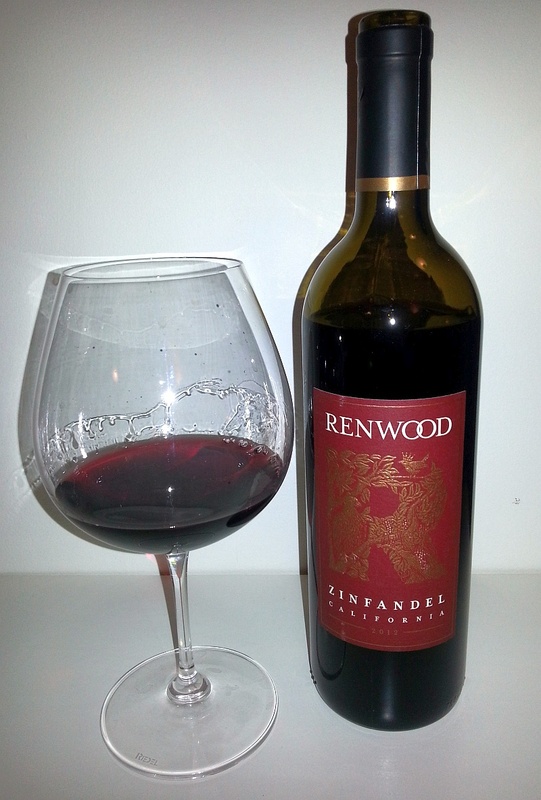 Renwood Winery creates a dozen distinctive Zinfandels every year, among other varieties by winemaker Joe Shebl. As of 2013, there were more than 48,000 acres of Zinfandel planted in California. 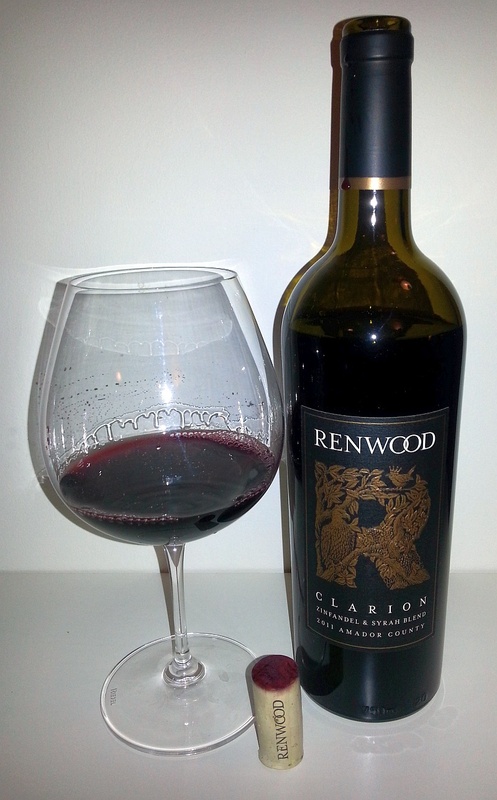 Renwood is located in Amador County, in Northern California, It was established in 1993 and specializes in Zinfandel made from old, dry-farmed vines. They are committed to environmentally friendly and sustainable farming and production techniques. Besides Zinfandel, they also do produce Rhone and Italian varietals. The two wines I received are primarily Zinfandel, but both have some other grapes blended in. You may notice on their logo, a wren with a crown and an eagle. There is a story behind it, read it here. This wine is a blend of 86% Zinfandel, 10% Primitivo, 2% Roussane, 1% Mourvedre, and 1% Souzao. So we have grapes from Italian, Portuguese, and French descent blended together in this wine. Deep ruby in colour but still translucent from the core to the rim. It has quite a range of aromas; smoky cherries and raspberries, leather, ripe sweet plums and raspberries, and hints of nutmeg and vanilla. It is dry, medium bodied, with very light tannins. It is quite smooth in your mouth and amazingly very light mouth feel. I usually expect a heavier mouth feel from Zinfandel, so this was a pleasant surprise. One thing I enjoyed about the wine is that you first get salty minerality followed by the fruit. I quite like minerality in wine. The wine has ripe, jammy raspberry and cherry flavours, along with some combination of tart of ripe berry fruits. There is a hint of milk chocolate in the background. This wine has 14.9% alcohol which you can’t tell until the finish when it gets a bit hot. On the finish you also get some mouth watering acidity and lingering tart berry fruits. Rating: A lighter bodied Zinfandel with nice minerality and berry fruit flavours. Clarion is their flagship red blend. It is composed of 75% Zinfandel and 25% Syrah. This wine was almost solid ruby from the core to the rim. It has a youthful, medium plus intensity of aromas covering vanilla, cocoa, sweet spices, sweet, ripe black fruit, raspberries, and blueberries. I should also note, that upon opening the wine, there is also a wonderful cedar aroma, which with a bit of air evolves into nutmeg. The nose on this wine is very mesmerizing. I gave the wine 2 hrs of decanting time and the only changes were less intense aromas, and some mintiness. So I would not decant this wine. Open and enjoy it. It is dry with medium acidity and medium plus body, and a silky mouth feel. It has medium tannins that get firmer toward the finish, giving you nice structure. Flavours of ripe raspberries, blackberries, blueberries, plums, vanilla and cloves fill your mouth. With decanting there was also some nutmeg and blackcurrant leaf, but it was quite subdued. This wine had a lingering finish with dark ripe fruits, sour cherries and cocoa. You can drink this wine now, and I think enjoy it for several years with aging in your cellar. Rating: A quality wine with layers of flavours to enjoy with good food. If you missed National Zinfandel Day, don’t fret. You can still enjoy Zinfandel any day. Give Renwood a try.